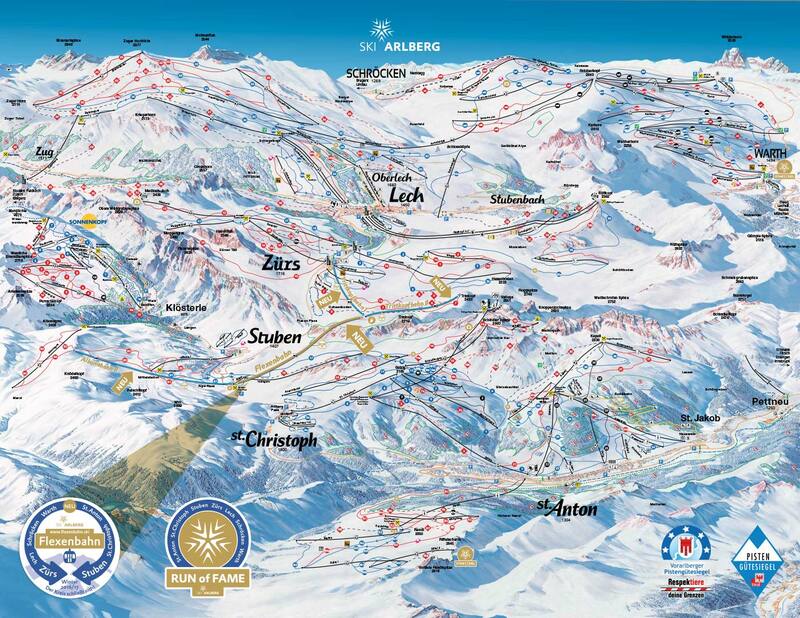 Three major lift changes/additions will integrate St. Anton/Lech-Zurs/Stuben and make the bus transfer from Zurs to Alpe Rauz no longer necessary. 1) The Trittkopf tram is being redesigned with a mid-station farther south. 2) The new Flexenbahn tram will run from Alpe Rauz up to the Trittkopf mid-station, replacing the bus transfer. 3) A new tram will run from Alpe Rauz up to the top of Stuben. This will be faster than skiing along the road to the Stuben base, then taking two slow chairs up. Astounding to see the level of infrastructure investment at the bigger Austrian and French areas. Being able to ski more or less the entire Arlberg via lifts, from St. Anton to Warth-Schröcken, will be a huge draw for those who'd never been there. I've been to the region three times and don't foresee a return simply because there are so many other places in the Alps I need to check out, especially the joints that are mostly t-bars. A return to the Arlberg is not high on my priority list either, but Liz has never been there so I suspect it will happen sometime. Since you didn't ski in the Alps last season, are you planning to next winter? If yes, which are the candidates? jamesdeluxe wrote: Since you didn't ski in the Alps last season, are you planning to next winter? If yes, which are the candidates? We will wait for the Diamond Dogs' schedule announcement in late August. If they choose a resort that interests us, we may do that so Liz can ski with some of her NYC friends. We would be likely to add on a week on our own. The Dogs' timeframe for the Alps tends to be late Jan/early Feb so we will be interested in your plans too. That will be our timeframe in any case because we will be skiing almost continuously from mid-February to mid-March in Canada plus Iron Blosam. Normally, I don't commit until late summer/early fall (last year was even later), but given the cheap Euro flights that are now being offered all the way through next March, I'm almost ready to pull the trigger on two regions that I discovered while researching the revised FTO ski map last year: the western Pyrenees in late Jan/early Feb (potentially volatile weather-wise, but I'm willing to roll the dice) and Switzerland's Central Valais region (not in Fraser's Top 10 snow-sure, but close) in early March. Early March in the Alps is always off the table for me, being between annual reservations at Mustang late February and Iron Blosam ~second week of March. Late March/early April at a high altitude spot like Val d'Isere or Zermatt is a possibility sometime, particularly since a general tourism extension in April could be attractive many places in Europe.